Books in Northport: Where Do Bluebirds Go When It Rains? Where Do Bluebirds Go When It Rains? It isn't always necessary to leave home to have a memorable adventure. Saturday’s morning clouds gave way to afternoon sun, although the temperature remained chilly by Arizona standards, and we were having a quiet day at home. As I was puttering about the kitchen area, starting yeast for a session of bread-baking and washing up the few odd cups and saucers, I glanced up and out the window over the sink. Oh, my goodness, be still, my heart! Blue angels — not the warrior type but truly angelic forms — were fluttering and swooping and landing on the black rainwater tank and flying up again, their brilliant azure color making it seem an aerial ballet was in progress in our backyard. A window screen frustrated my camera efforts, so I exited by the front door and circled around to the back of the cabin, but the wary bluebirds vanished into the wash. I am capable of great patience, however, and so I settled into the driver’s seat of the car with window down with a good book and waited, and when they returned — because they did return, within the half-hour — I was as ready as an amateur camerawoman without a telephoto lens can be. Ah, yes, the lack of a telephoto lens! I had one with my previous camera and was able to satisfy myself (if not National Geographic) with the bird photos I was able to achieve in 2015 and 2018, but when I bought a new camera and a few extras it seemed a sensible line had to be drawn somewhere. Well, clearly, I see now, I drew that line in the wrong place. (It would have been much wiser to do without the camera case.) And so, my images here do not even begin to capture the magic that came to Dos Cabooses on Saturday afternoon! Turquoise blue, paler below, belly whitish. No rusty. [This distinguishes the mountain from the western bluebird, which sports a rusty breast.] Female: Dull brownish, with a touch of blue on rump, tail, and wings. The habitat for this bird is listed as “Open country with some trees; in winter, also treeless terrain.” Those italics are mine. Because while we are not entirely without trees in Dos Cabezas — there are some conifers and chinaberry trees around a few of the houses, and in and near the wash there are numerous netleaf hackberry trees — “mesquite and arid brush” would be a fair description of this land not noted for trees. We are, however, in the winter season, and the color descriptions in Peterson match the birds I saw. While I would at least equally thrilled to have indigo buntings visit, bunting and bluebird have very differently shaped beaks, and that reminds me of an idea I had for a different kind of bird guide, perhaps not an all-inclusive guide to include water birds and hawks and such, but a guide to the passerine species, i.e., those that perch. My guide would simply group and identify each bird by the size and shape of its beak. Think about it. How often, after all, do you see a feathered creature only in profile, against a bright sun, when you cannot discern the color, much less identifying marks? Falling in love with birds, though, one learns early on that seed eaters and insect eaters have different beaks; that thrashers’ and thrushes’ beaks differ from those of finches; etc. My guide, therefore, would simply take the beak as the basic identifying clue. It would, of course, be used in conjunction with other guides — but then, whoever could be content with only one bird guide in the first place? 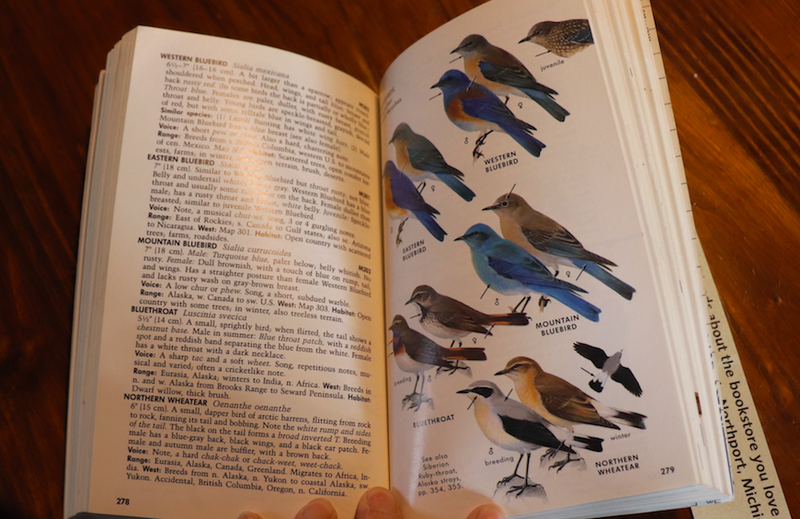 Some present photographs, others illustrations, a few helpful silhouettes; one guide groups by color, another by family and genus. As for my photographing of the Saturday visitors, I have to acknowledge disappointment, but that disappointment was trivial next to the thrill of the birds themselves. I saw them! We saw them! 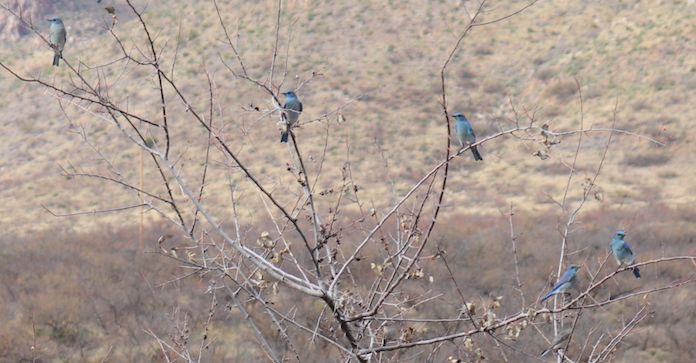 A single bluebird would have been exciting, but two dozen of them all at once?! And — they came back on Sunday! Only once, and I only tried through the kitchen window/screen, but they were really there. See them, both perching and flying? Note: Excitement has clearly triumphed over literary style in this post, but I offer no apology. To be visited by angels, of any color at all, is not something that happens every day. And blue angels? So many of them? I rest my case. They are so beautiful! I can feel your excitement. Deborah, it really was exciting! I had a couple of responses by e-mail this morning, too. The first friend wrote, "Oh!! I had no idea that you saw SO MANY! They must have been just spectacular! I can see why you got so excited! Their color is just so beautiful!!" And the second said, "Ah, your blog is SO lovely today! Thank you for taking me to dreamland for a while." I am happy to share my excitement! basis, calling in their sightings. You would win, hands down! BB, I wrote a post in a previous year called (I think) "Not a Serious Birder," and I'm really not. Certainly not a competitive birder. I'm just in it for the occasional heartlift.